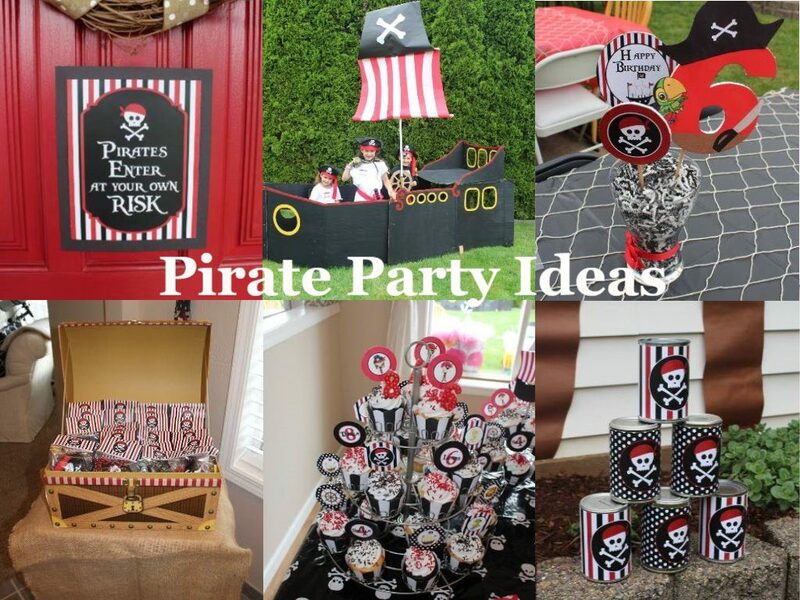 Summer is just around the corner and a pirate party is the perfect summer party theme. 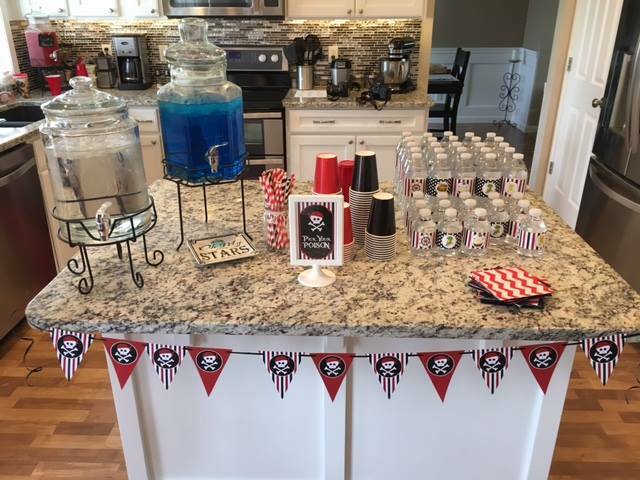 My friend threw this party last summer for her 3 kids and there are so many amazing details to share. 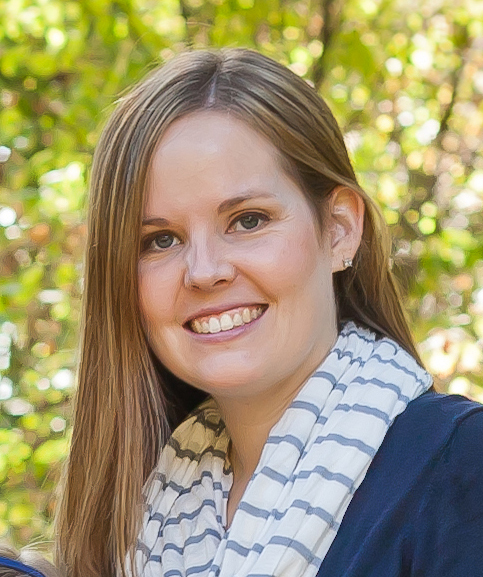 You guys….. 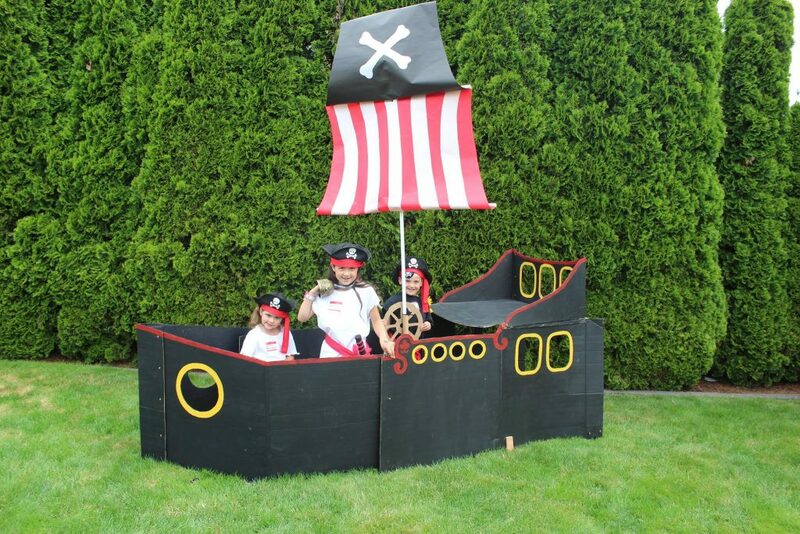 THIS PIRATE SHIP!!! This was by far the coolest part of the party. My friend made this out of cardboard boxes and craft paint. 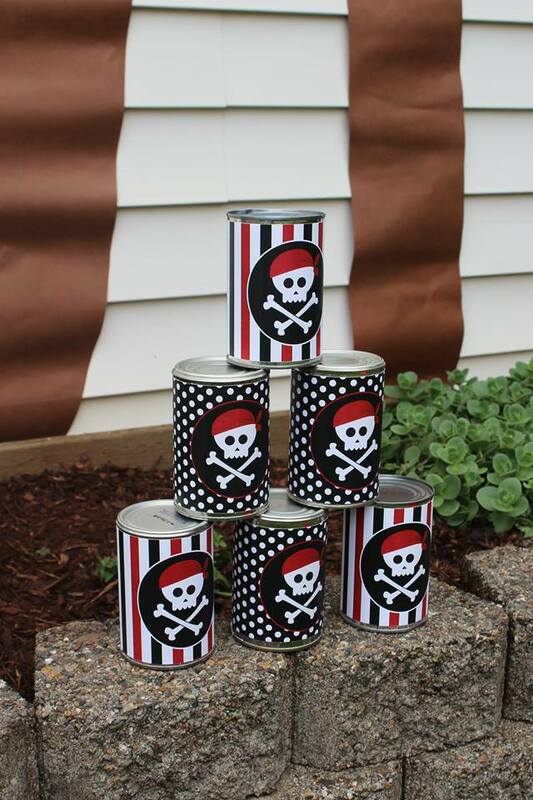 A few PVC pipes for the frame of the pirate flag. Isn’t it the coolest thing ever?!?! 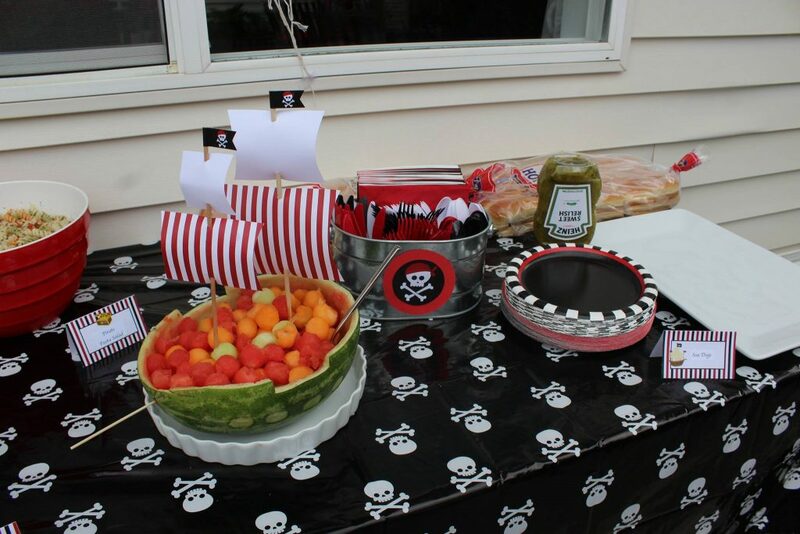 The guests all came dressed as pirates and had so much fun in this ship. 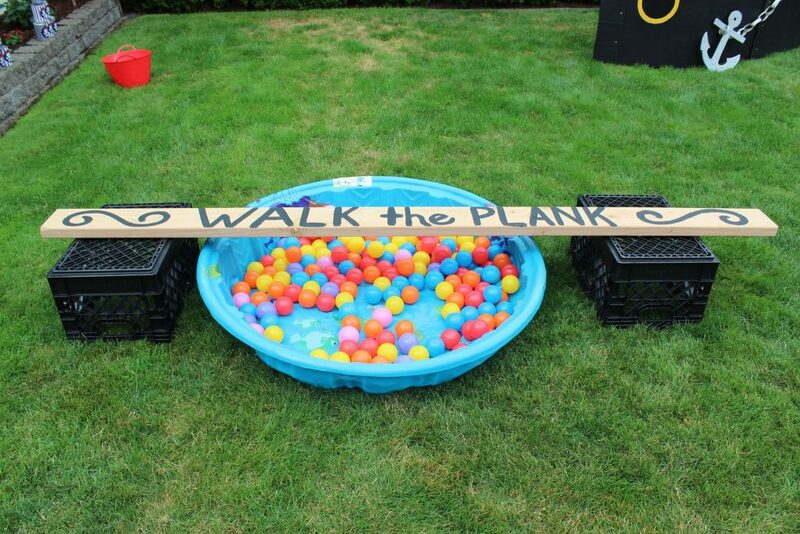 No pirate ship is complete without a plank to walk. The kids had a blast walking over this plank over and over. 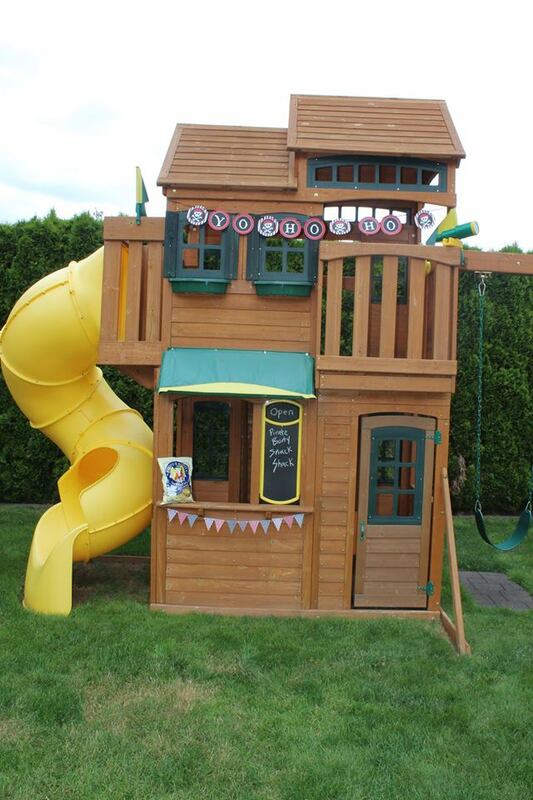 The play structure got a make over. 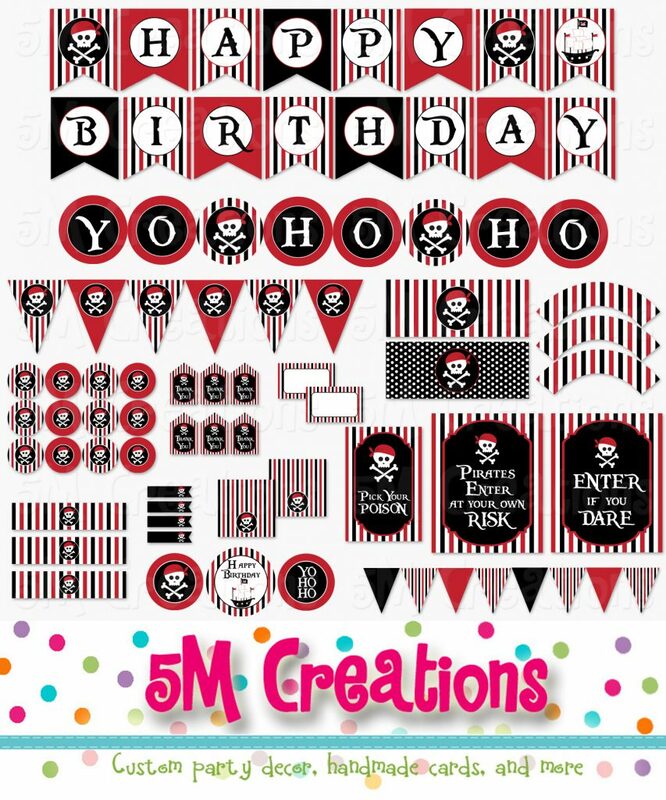 Our printable Yo Ho Ho banner was an adorable addition. 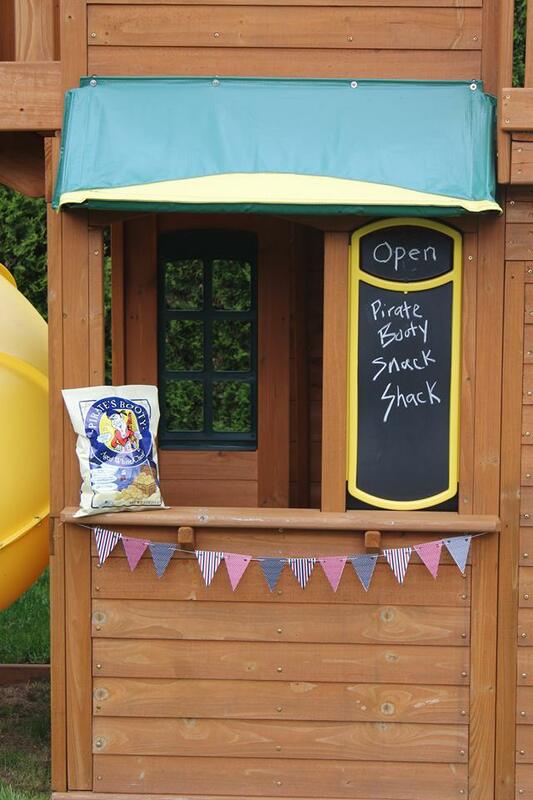 The playhouse became a pirate booty snack shack with a sweet printable pennant banner and snacks. A cute spot for photos was created with colored butcher paper palm trees. 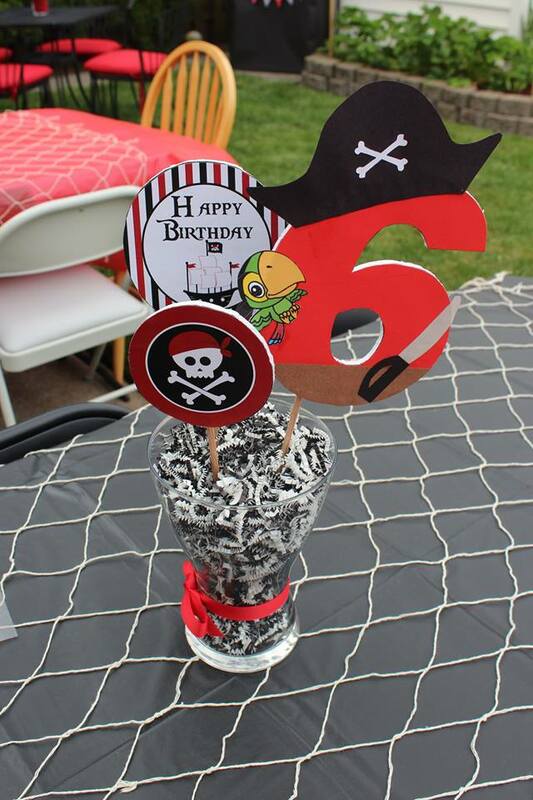 Printable labels on cans were used to create a ball toss game for the pirate guests. 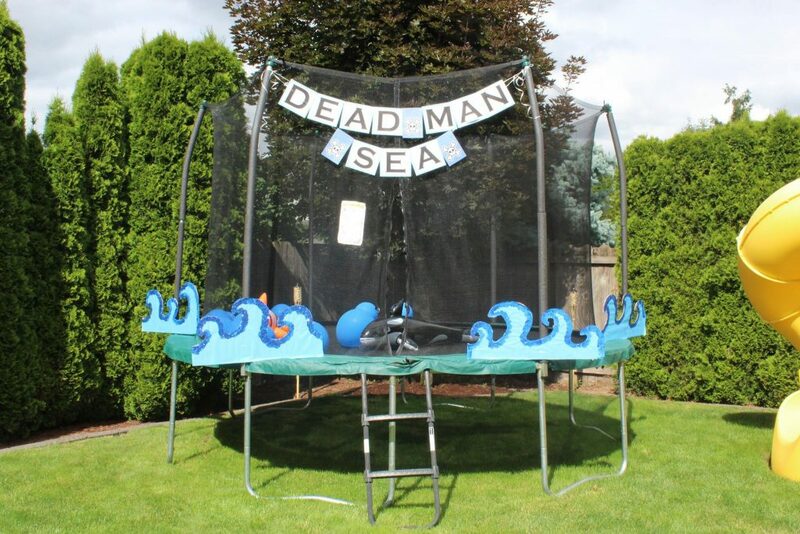 The trampoline became Dead Man Sea! Adorable!!! 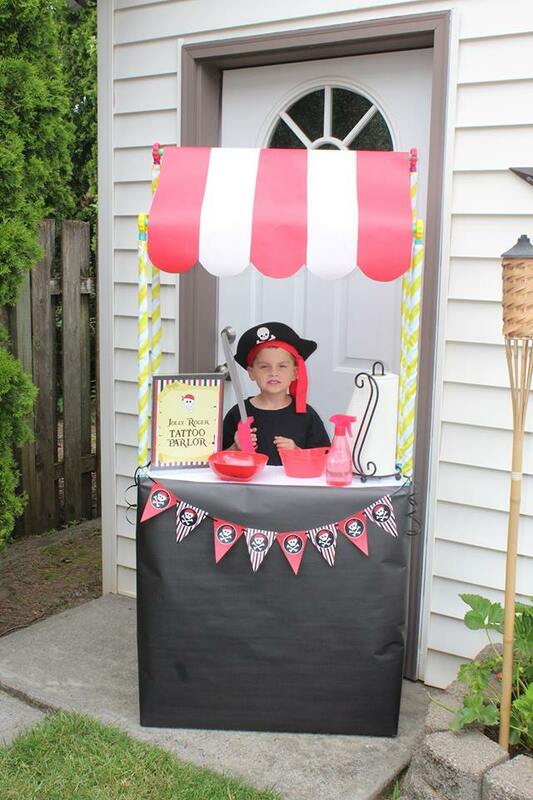 A lemonade stand was dressed up with butcher paper, a printable pirate pennant banner and printable sign to make a temporary tattoo parlor. 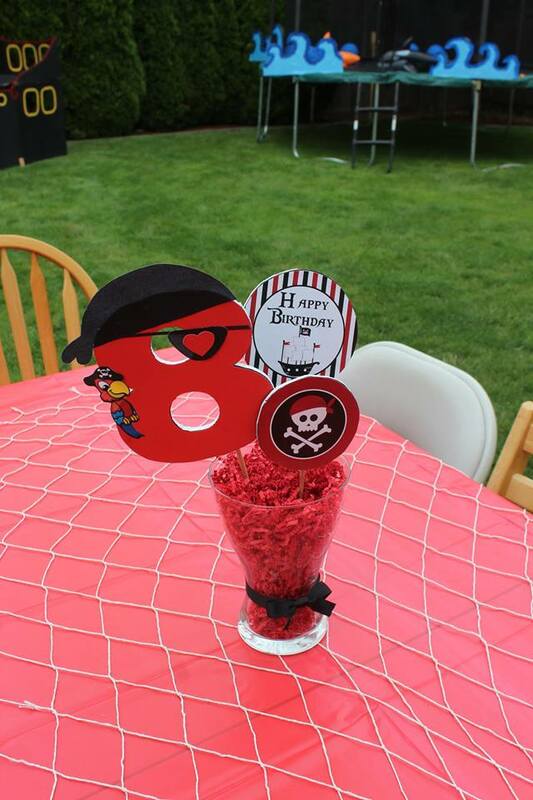 My super crafty friend made these amazing pirate numbers for each of her kids. 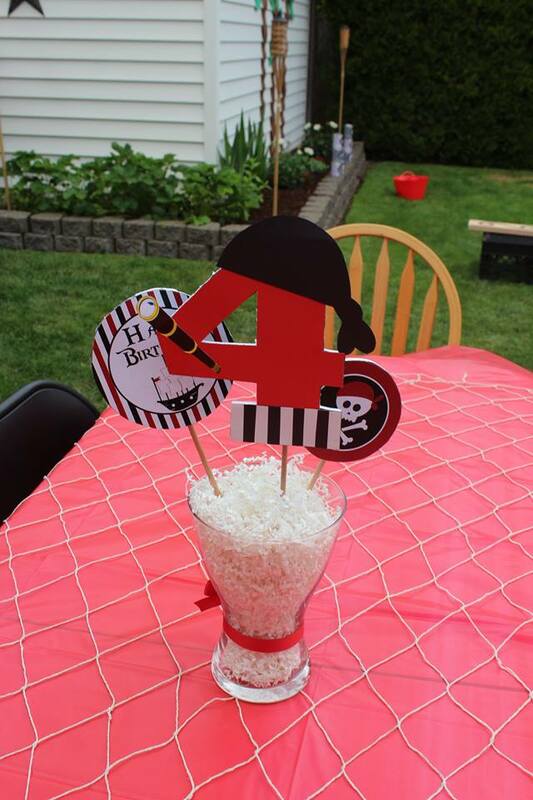 She added them to a container with my printable centerpiece circles. 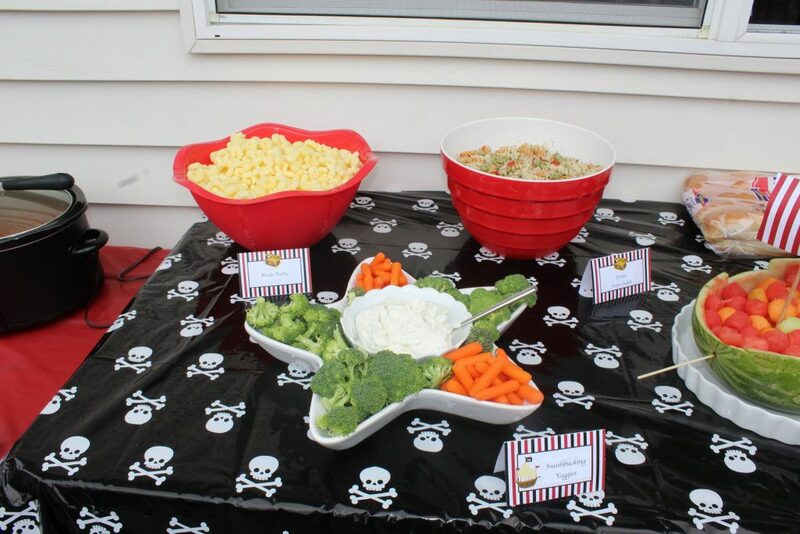 All of the party food had fun pirate themed names using our printable pirate food tent cards. 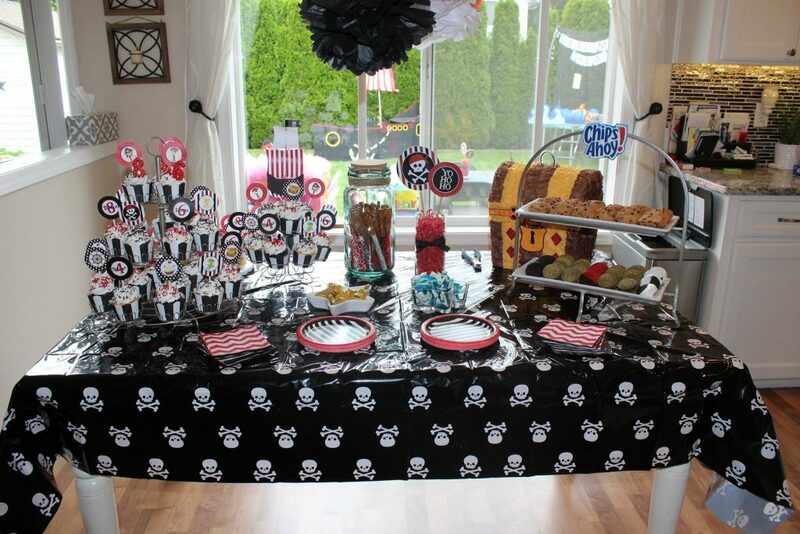 I love all the details in this sweets table. 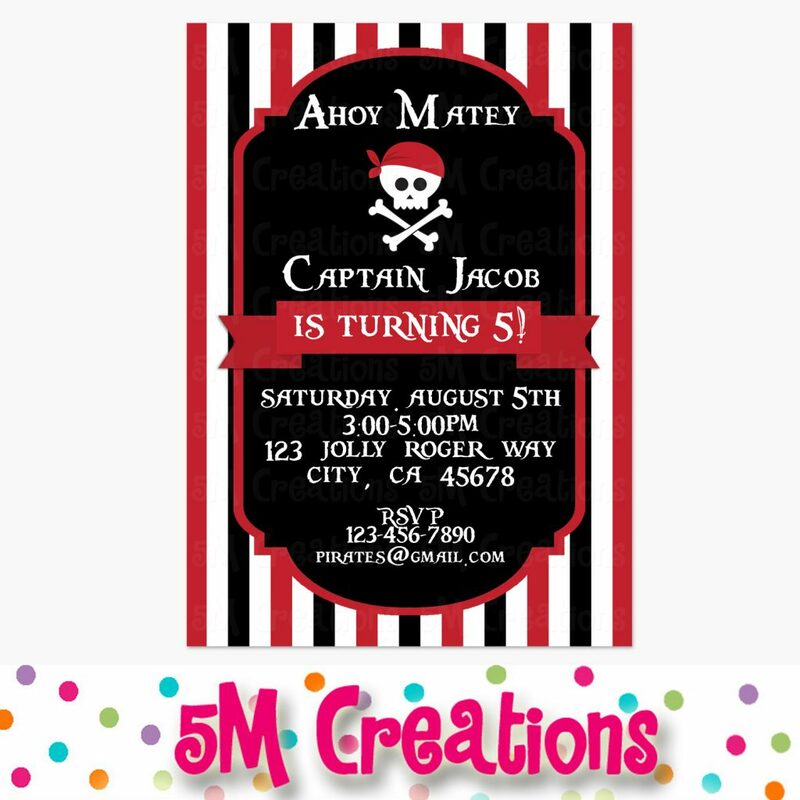 Printable pirate cupcake toppers add lots of fun pirate details. 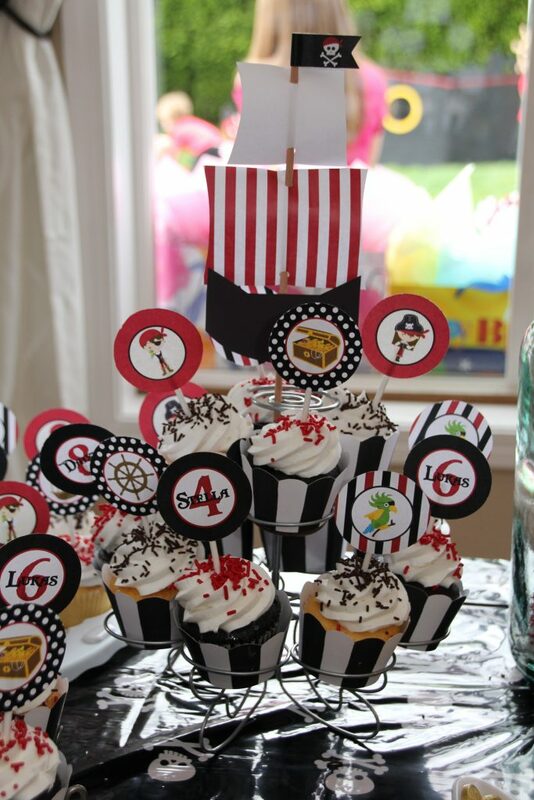 A paper pirate ship was the perfect topper to the cupcake stand. 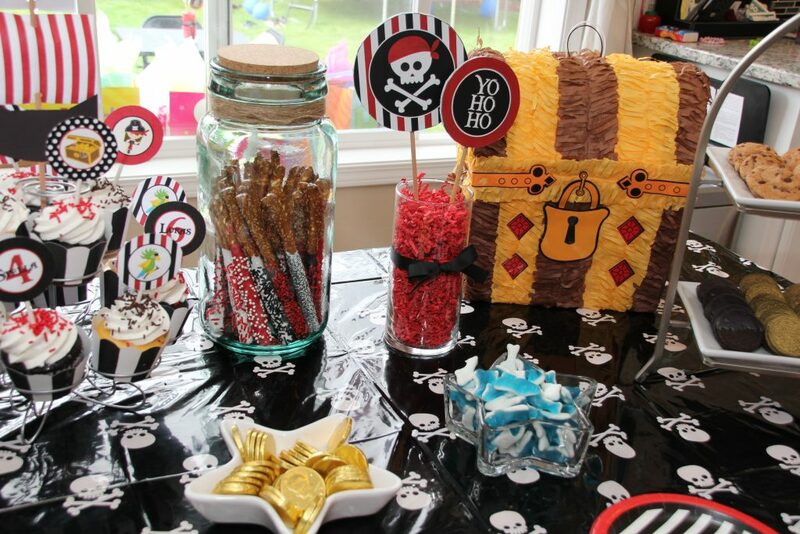 Gold deplumes were were made out of oreos, gummy sharks, and a treasure chest piñata were all fun additions. 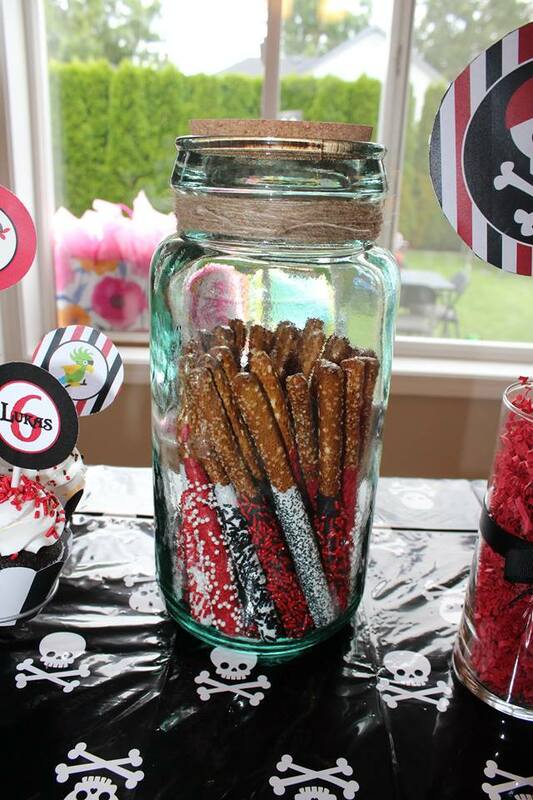 This amazing jar was the perfect nautical touch to hold dipped pretzels in the party colors. 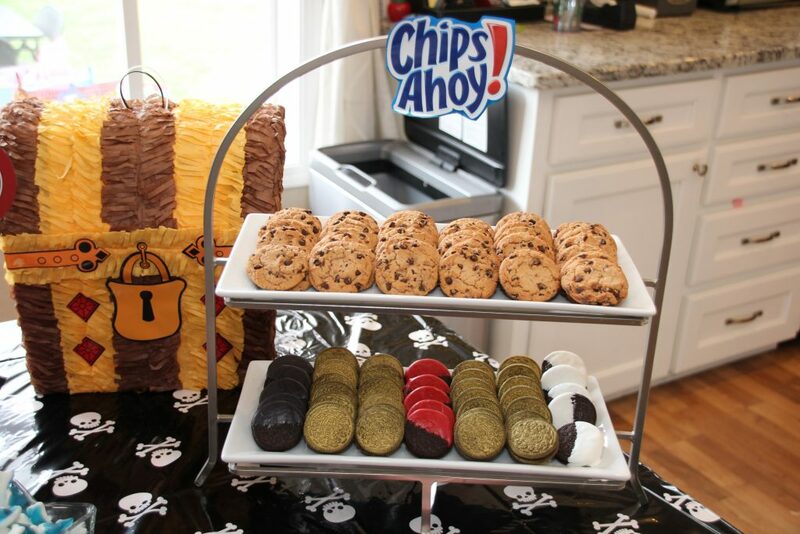 Pick Your Poison at the beverage station. 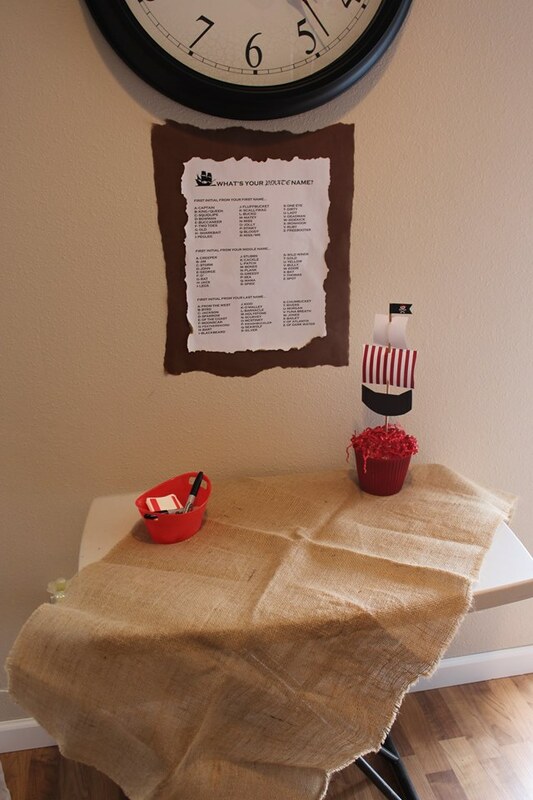 Create a name tag with the fun pirate name chart. 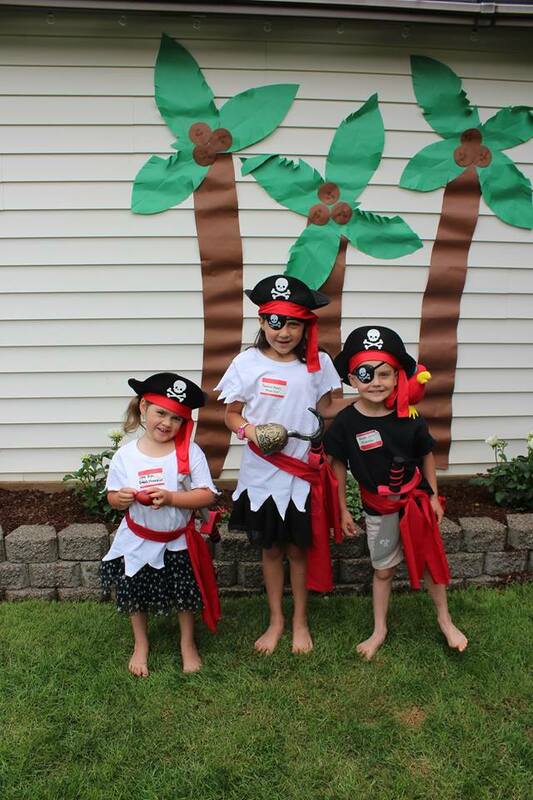 Crafts included message in a bottle necklaces for the girls and foam pirate ships for the boys. 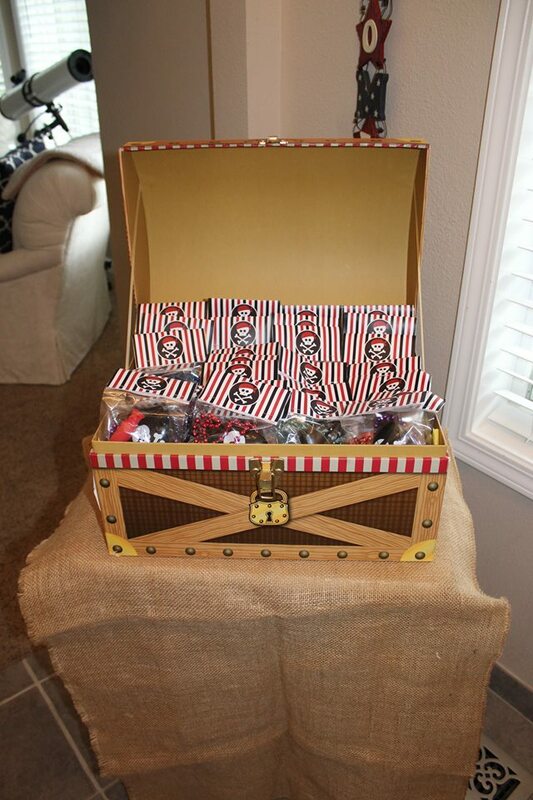 Our printable treat bag toppers were used to make favor bags for guests with eye patches, pirate treasure beads, a spy glass and more. 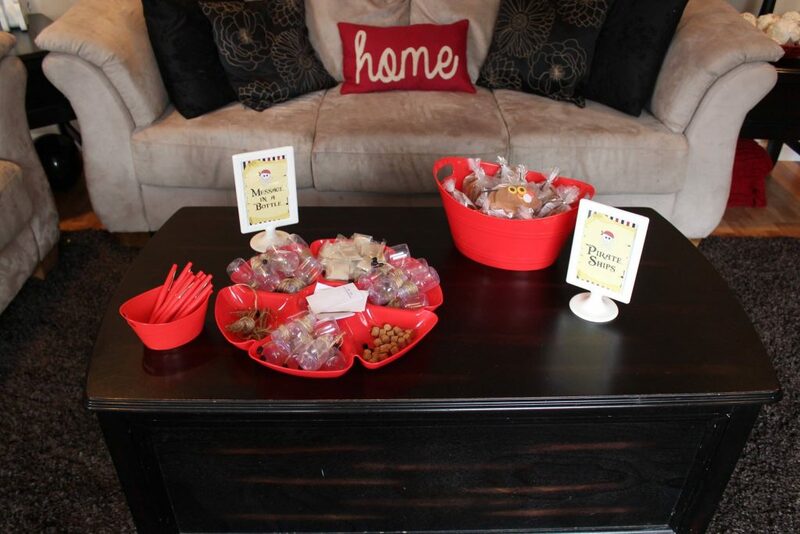 This party had so many amazing DIY touches. The kids all had a blast! 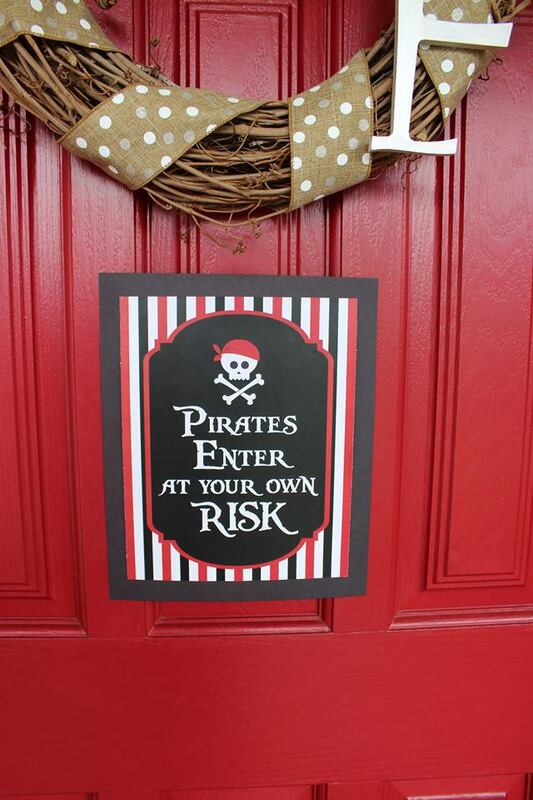 I offer 2 styles of printable pirate décor in my shop. 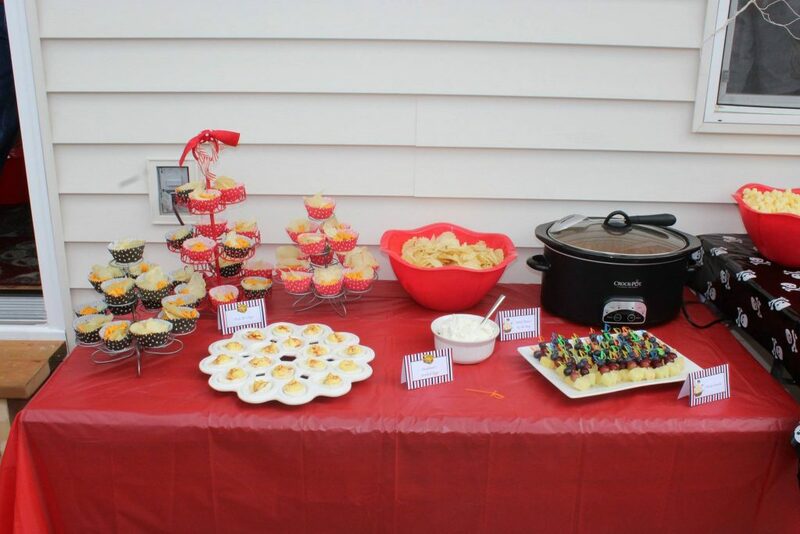 This party used parts of both packages. They can easily be mixed and matched. 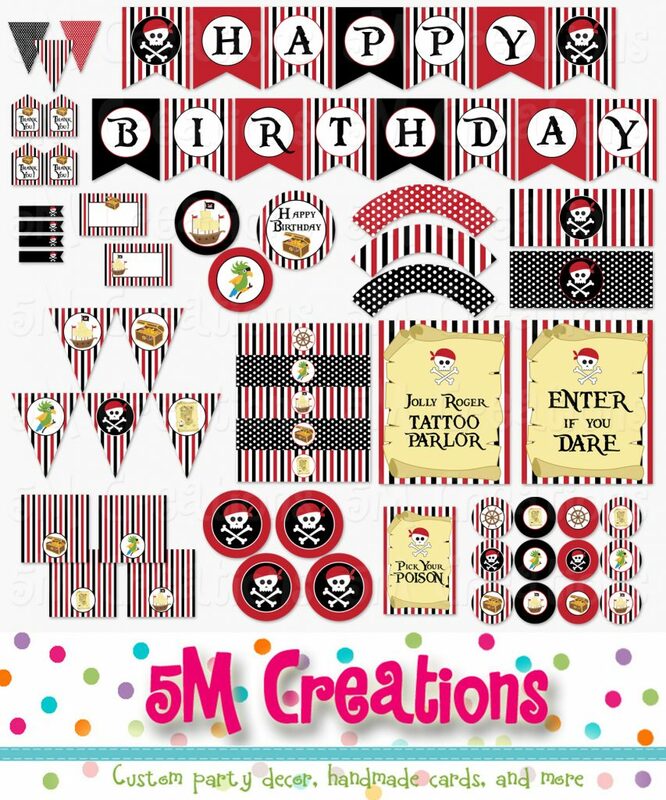 Both printable party décor packages include lots of great items: Happy Birthday banner, pennant banners, cupcake toppers, centerpiece circles, water bottle wraps, favor tags, party signs, and more.